Russia, purana Soviet Union ke des, emigrant log dunia bha me, jaada kar ke UK, Germany, Israel, United States, Canada, Australia aur Latin America me. Russi aur Russian Bhasa(Russian: русский язык, transliteration: russkiy yaz'ik) ek East Slavic bhasa hae. Ii bhasa, Indo-European bhasa family ke hae. Russian, Slavic bhasa me sab se jaada log baat kare hae. Russian, Russia ke official language hae, Belarus, Kazakhstan aur Kyrgyzstan ke bhi official language hae. Russian, United Nations ke chhe official languages me se ek hae. Russian me baat kare waala des me larrkan log ke naam uu logan ke pitaji ke naam se aae hae. Russia ke sab se jaana maana naam Anastasia hae. Larrki log ke biich waala naam uske pitaji ke naam me ek feminine ending chaahe "evna" nai to "ovna." jorr ke banawa jaae hae. Larrka log ke naam bhi pitaji ke naam me ek masculine ending chaahe "evich" nai to "ovich. "jorr ke banawa jaae hae. Larrki log ke uske pitaji ke last name me "a" jorr ke banawa jaae hae.Larka log aapan pitaji ke naam ke use kare hae. (Alphabet book ke ek panna), pahila book rahaa jon ki Russian bhasa me chhapa gais rahaa. 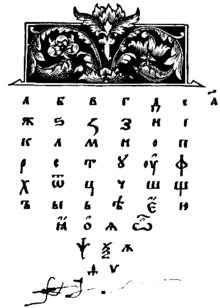 Printed by Ivan Fyodorov in 1574. Ii panna me Cyrillic alphabet hae. Older letters of the Russian alphabet include ‹ѣ›, which merged to ‹е› (/je/ or /ʲe/); ‹і› and ‹ѵ›, which both merged to ‹и› (/i/); ‹ѳ›, which merged to ‹ф› (/f/); ‹ѫ›, which merged to ‹у› (/u/); ‹ѭ›, which merged to ‹ю› (/ju/ or /ʲu/); and ‹ѧ›/‹ѩ›, which later were graphically reshaped into <я> and merged phonetically to /ja/ or /ʲa/. While these older letters have been abandoned at one time or another, they may be used in this and related articles. The yers ‹ъ› and ‹ь› originally indicated the pronunciation of ultra-short or reduced /ŭ/, /ĭ/. ↑ "The World's Most Widely Spoken Languages". Sint Ignatius High School. ↑ "Russian Language Institute". Ruslang.ru. Retrieved 2010-05-16. Ii panna ke 26 December 2018, ke 03:16 baje, pichhla time badla gais rahaa.